November is a month when all kinds of good things are happening in our special neighborhood, on the Upper West Side of New York City where joyful plate calls home. We have been in support of WSCAH (The West Side Side Campaign Against Hunger) for over ten years, working in friendship with Executive Director Stewart Desmond. Founded in 1979, WSCAH is an emergency pantry, counseling service and job-training/placement center. The West Side Campaign Against Hunger created a customer-choice pantry, where clients select food from shelves rather than receiving a pre-packaged bundle. It is a program that supports customers in so many ways, like the WSCAH chef training program led by the extraordinary Chef Andrea Bergquist. Every Thanksgiving, WSCAH hosts a Thousand Turkey Challenge. 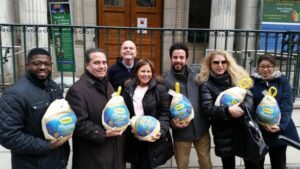 Featured here, Columbia University Facilities donated 200 turkeys. And just yesterday, my client Jacobs Pickles donated 50 turkeys as they do every year. 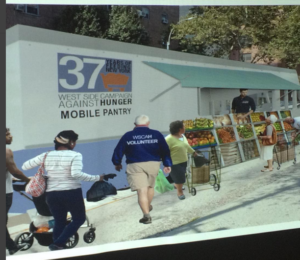 WSCAH is thrilled to announce the launch of an innovative mobile pantry next April 2017, which will bring to New York’s food deserts the special combination of healthy food and social service counseling that WSCAH has been offering at its brick-and-mortar site since 1979. Last year the Upper West Side location distributed 1.7 million pounds of food to New Yorkers in need. The Mobile Pantry project is particularly focused on providing fresh produce to low-income seniors in Manhattan and Bronx neighborhoods. Stay tuned for more details and press releases. Donate to WSCAH, thank you. joyful plate is thrilled that our generous neighbors bid for our risotto party at this month’s WSCAH annual harvest dinner. We are grateful to our wine partners in the past including Masi Amarone and Royal Wines Corp and look forward to more support. Thank you for the opportunity to work in such a wonderful and generous community!